The revelation made sense to me. As I departed with this mandate directing me, listening to Little Richard holding forth with Slippin’ and a-slidin’ would have been good background music. Thank goodness for anti-lock brakes and FWD! Awaiting further orders, these ice crusted switch engines appear unfazed by the light coating of ice they are wearing. I saw them as I was crossing the viaduct barely visible in the right center background. They were saying "shoot us, shoot us .... ." Who could say no? Not I. Had I not obeyed the aforementioned Divine guidance, I would not have seen my friend Jon Phillipi and he would not have joined me as we toured the frozen underbelly of our environs. The first thing we encountered was not the line of locomotives above, but an icicle encrusted bell. See it where this story started on the Photo of the Week page at Corndancer dot com. Click here to go there, a very cool thing to do. We’ll wait while you click. A closer look reveals an open door (and windows). Perhaps this is a defensive move. After all, miscreants generally will not break an open door. And the temptation is removed. You can also detect the rows of icicles. When you look at the door which will admit a grown man, you begin to get an idea of the size of the locomotive. Ain't a small thing. One may safely presume the railroad had other things in mind for these switch engines when they placed the order and signed the check. 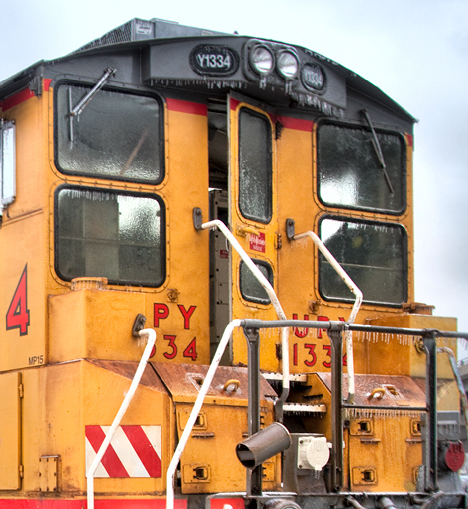 Our good wishes to the railroad that the intended use of these locomotives be fulfilled. It will bode well for us all. When these engines are running, so is our economy. It can’t happen soon enough. Under normal circumstances, this is not a healthy place to be. It's not often one of these monsters holds a pose for you. In the meantime, cameras love trains and people like pictures of trains so there is at least one good outcome. Those of us who remember the steam whistles silenced long ago by the air horns of today, can also remember the huffing and puffing and magnificent displays of steam and smoke. 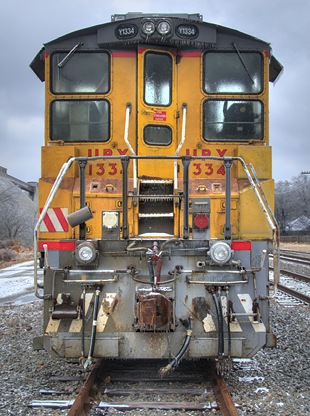 Several years ago, just a few miles from this forlorn machine, I had the opportunity to shoot Union Pacific’s magnificently restored engine 3985 under a full head of steam. 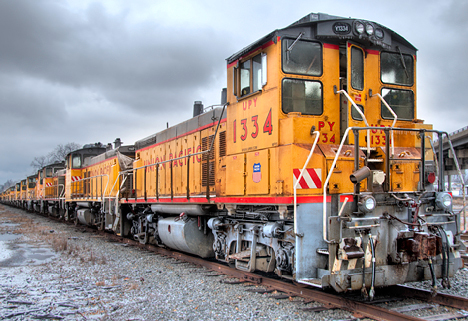 The big iron horse sped by with little noise and clanking, much quieter than its modern counterparts. An amazing machine. Thanks UP! Send her back again. Ice had covered one of my front yard camellias. A couple of years ago, about this time, I posted a story on Corndancer dot com, the subject of which was the cussed toughness of a camellia bush. One simply does not normally think of flower plants and the word tough in the same breath. Check it out here, if you missed it on Corndancer. 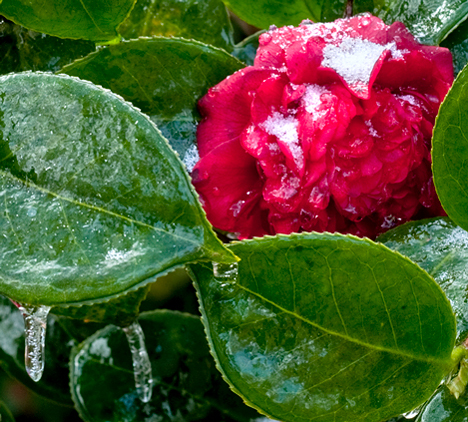 The coating of ice does not deter the hardy camellia from its destiny to bloom and survive. The shoot was yesterday and today the ice is melting from the trees. It’s like another storm, except this one is in winter sunshine. The water stored in trees and shrubs as ice is now filling drains, puddles, and ditches. Mother Nature’s seven-fold amen to an ice storm. Or perhaps an encore. If you’d like to see a gallery high-resolution versions of our Corndancer and blog photos for this week, click here.